Donald Trump is actually executing a brilliant strategy of deception. He has the establishment GOP thinking he is all Tea Party and he has all the Tea Party thinking he is the establishment. For being critical of him, I have been called a neocon AND a right wing extremist within an hour of each other. Trump is running a variant of the Iranian “Death to America” scam. His followers are reacting just like Obama did to the Iranian mullahs by saying, “they say that but that’s not what they mean.” If I wanted to destroy the Republican Party once and for all, Trump would be the kind of interloper I would send in. During the Crusades, Christians held an impenetrable castle in Syria that controlled the main route through the area. 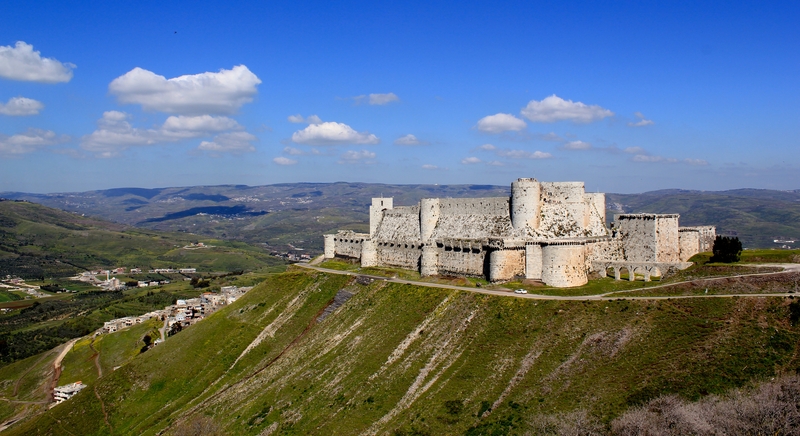 The Krac des Chevaliers was built by the Hospitaller Order of Saint John of Jerusalem. It was so impenetrable that even though the Muslim army outnumbered the Christian knights 20 to 1,the 12,000 Muslim soldiers equipped with state of the art siege engines could not breach it. It was only taken over in 1271 via an act of deception when the Muslim general, Sultan Baibars, captured it by way of a forged letter purportedly from the Hospitallers’ Grand Master that caused the knights to surrender. Of course, he promised the knights safe passage and then beheaded them after they surrendered. I guess they were chanting “Death to Hospitallers!” but the knights didn’t think they meant it. Once this fortress was lost, the Christians were completely driven out of the Middle East. Trump has brought the same kind of letter to Krac des GOP with his populist, anti-political correctness shtick…but his credentials are just as fake as Sultan Baibars’ forged letter. For goodness sake, I know we want a strong presence – but go do a little googling on Donald’s former positions. He’s a Democrat when he needs to be and a Real Republican™ when it furthers his goals. One thing he has never been is a conservative. Trump has made billions by doing whatever is necessary to make a deal work. This man has no allegiance other than to “the deal” and his current deal is that he wants to be sitting in the Oval Office. We have 16 other strong choices (well, probably 10), let’s not be so blind to the deception. We have good, strong candidates with all the upsides of His Hairness and none of his downsides. Trump is nothing less than Sultan Baibars in a bespoke Savile Row suit. August 8, 2015 in 2016 Election. Count me in as well! Just another wolf in sheeps clothing. Trump has never been anything other than a self serving taker. Name the Ten strong choices. Cruz, Walker, Fiorina, Perry, Jindal, Paul, Carson, Rubio, Kasich and Bush. Even Bush is a better choice than Trump. Agree about Cruz, Walker, Jindal, Paul and possibly Fiorina. !!!! Maybe Perry. Carson has proven he is anti-second amendment with multiple statements in writting and on video ( recent ones I might add). If we are to say he has “Moved on” or “evolved” from those statements…..then the same should be applied to Trump. But No Bush is not a better choice than Trump IMO. -Rubio just yesterday on Hannity doubled down on his Gang of 8 AMNESTY push. Saying we can’t address the Illegals here UNTIL we address other immigration issues. Which is of course a false premise, and the lynchpin upon which the “Comprehensive Immigration” Scam is built and pushed. He is still clearly the front man for illegal Amnesty and working “the Deal” for Both the Democrat Partry and the Us Chamber of Commerce. In that regard, for Rubio, nothing has changed. Constitutionally he is of course Wrong. Implying we can’t walk and chew gum at the same time. Instead of learning and saying CLEARLY….America should Follow the law ( as Rand Paul said to Christie Re: the 4th Amendment), Rubio doubles down on the position of holding the Country “hostage” on immigration until they get to pass their “Deal” which BTW includes allowing the breaking of the law by a Select group of people. Thus it is also a Socially divisive position which establishes by “law”, if they allowed to succeed, that some have been given a pass to break the law based on their race and/or birth origin being specifically NOT American. Bush is also divisive on this issue with his comments contrasting hispanics and whites. And saying that hispanics love their families more and are more prolofic and thus implying more valuable to America than native born whites. Why weren’y these “past comments” presented by Kelly et al ??? I would say rather, after Dole, McCain and Romney,..If I wanted to destroy the Republican Party once and for all, another BUSH would be the kind of interloper I would send in. This description fits Bush to a “T”….minus the honesty of him admitting it. -The Bushes and Clintons are strong friends….and each admit it. -Jeb is FOR what is essentially Common Core centralized gov’t “regulating” Education ( as is Rubio). The lip-service to States deciding when parsed clearly showed his ( their) support of “Standards”… code word for Common Core. – Jeb is FOR ObamaCare ( and has financially profited from it ). -Jeb is FOR AMNESTY ( via the “Comprehensive ” double-speak). -Jeb is FOR increased inflow from Mexico and below. ( He didn’t say anything positive about immigration from European countries for instance). -Jeb is for growing government. In short he is exactly like Hillary on these issues. None of those position is even remotely Conservative. I think one could substitute BUSH in the sentence above and be pretty accurate.I will be adding a link of just one of these later to show this. But my post is getting long. So I would say we have 6 possible candidates. As the others are “Business as Usual” much as Hillary is. If the boy is a Trojan horse…good for him. The American people need to be awakened. Unless this boy’s a really great actor, (which I doubt….no offense to him, btw) I truly feel that he is very sincere in his love for this country, and does want to make America great again. Think on this: He got 24 million (record breaker) to watch a Republican debate. He’s like the flippin Tebow in politics. I do not think this boy can or should be so easily dismissed. Personally, I should very much like to have a billionaire or a brain surgeon appointing the executive branch positions, rather than a community organizer who is an utter failure……..and he is. I agree with you Kells on this !!! !…..sans the brain surgeon ( see my other comment on other Post).